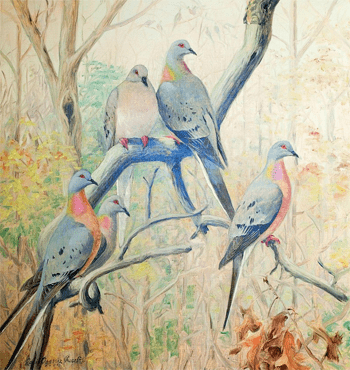 Passenger Pigeons by Louis Agassiz Fuertes. A hundred years after they went extinct, Passenger Pigeons are suddenly everywhere you look on the Internet. Scientists and historians, newspapers and blogs alike are revisiting what is likely the starkest conservation lesson we’ve ever learned. That’s because Monday, September 1, 2014, marks the centennial of the death of Martha, the very last member of what was once the most abundant bird on the planet. We learned the main lesson quickly, Fitzpatrick argues: that extinction is forever, unless we do something about it. The Migratory Bird Treaty Act was passed just four years after Martha vanished; and eventually, in the 1970s, the United States passed the Endangered Species Act—a powerful piece of legislation that likely would have saved the Passenger Pigeon had it existed during the bird’s decline. But there are other lessons that we’ve been slower to learn. The epic scale of the Passenger Pigeon at its height—those sun-darkening flocks; the boughs that broke under the combined weight of all those perching feet; the barrels upon barrels of salted pigeon meat—seem to put the bird in a class by itself. To many people it is a mysterious disaster, but a unique one that surely could never be repeated. To which Fitzpatrick says: this disaster has already been repeated, in the commercial cod fishery in the Atlantic. And it is being repeated again right now, with Atlantic bluefin tuna. With the seabirds of the open ocean. With what few native birds of Hawaii still remain. With the aridlands of the West. These are all issues addressed by the 2014 State of the Birds report, due to be released in just over a week. Written by bird conservation experts from the Cornell Lab and other nonprofits, government agencies, and academia, the State of the Birds has functioned since 2009 as an early warning system as well as a chronicle of conservation successes. This year’s report takes the lessons of the Passenger Pigeon to heart and, with the help of massive datasets that have only recently become available, identifies the conservation challenges of the future so that we can work at averting them. Extinction is forever, unless we do something about it. The second half of that lesson is what keeps conservationists going. It’s not just wishful thinking—we’ve proven it with decisive victories that brought species like the Bald Eagle, Brown Pelican, and Peregrine Falcon back from the brink. As the 2014 State of the Birds report shows, we still have many bird species on a Passenger Pigeon-like trajectory. But with all of us pulling together, it’s a fate that does not have to be repeated.